Now on to my favorites…………now I am not going to write full reviews or tell what ages of kids would like them because then it would just feel like I was working, and that is not what I want to do on the weekend. 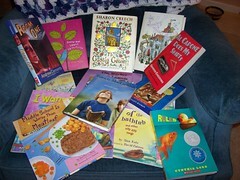 So I will tell why I loved each book. Oh, and they aren’t in any particular order. 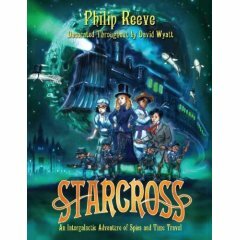 Starcross by Philip Reeve is a sequel to the very funny sci-fi/fantasty epic Larklight. I enjoyed Larklight but I LOVED Starcross!! I don’t want to talk too much about the plot because it would give away things that happened in Larklight but let me just say that it involves lots of space-related adventures and some evil top hats. It made me laugh out loud so many times because of all the absurd goings-on and also the fantastic illustrations by David Wyatt. I also really love that it is a Victorian adventure set in outer space. The Luxe by Anna Godbersen has the most gorgeous cover I have ever seen. That is why I picked it up and that is one of the reasons why I really love it. It is like Gossip Girls but set at the turn of the century. I would never willingly pick up a Gossip Girls book, but apparently all an author has to do is change the time period and make the clothes much more interesting and I am hooked. The Luxe is about the lives of rich, jealous, lying, back-stabbing teens in New York City. It is a totally fluffy, cheesy read that is just like reading a good romance novel, but with a much better cover. 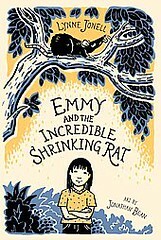 Emmy and the Incredible Shrinking Rat by Lynne Jonell was really really fun to read. It is one of those books that you have absolutely no idea where the plot will go next because so many random and crazy things have already happened. Poor Emmy thinks that everyone in her life is ignoring her (parents, teachers, classmates) and so the only friend she has is a rat that can apparently talk only to her. This book made me actually want to go out and find my own pet rat (but I wouldn’t put him in a cage, because apparently they don’t like that). Lots of shrinking occurs to many of the characters as well as some other unfortunate things, but everything turns out rosy in the end, which is the way I like it. 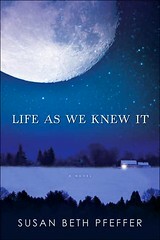 If anyone wants to work at my library, it is a requirement that you read Life as We Knew It. I made it five months before I read it, which is probably more than most people. This book is so haunting and depressing, but in the most fantastic way. The moon gets hit by an asteroid that pushes it closer to the earth, which is fine until earthquakes, tsunamis, and volcanoes start happening all over the world. It is told through the diary of one teenage girl in Pennsylvania and how she and her family deal with the end of the world. After reading this book, I ate salads for ten days straight even though I hate lettuce because in one part she mentions how much she misses fresh lettuce. I still have at least one bag of lettuce in my fridge right now just so I won’t have to worry about not having it available. This is another book that hooked me with the cover. Isn’t it wonderful?!! 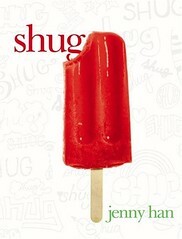 Shug by Jenny Han is an amazing book about a middle school girl who discovers she is in love with her best friend Mark. That’s pretty much all you need to know right there. This book totally has the “middle school” feeling down cold. I felt like I was back in seventh grade, an insecure girl trying to figure out why my life was so hard all of a sudden. I totally cried rivers of tears at the end (which is kind of weird because it isn’t really sad) but I can’t wait to read it again. I am holding myself back from starting it again right away, but I probably can’t wait much longer. Since this post is getting kind of long and I don’t want it to take up the whole site, I will hide the rest of my selections under a cut. So if you really want to see the rest of my favorites, continue at your own risk.